Bisti Badlands is an amazingly scenic and colorful expanse of undulating mounds and unusual eroded rocks covering 4,000 acres, hidden away in the high desert of the San Juan Basin. 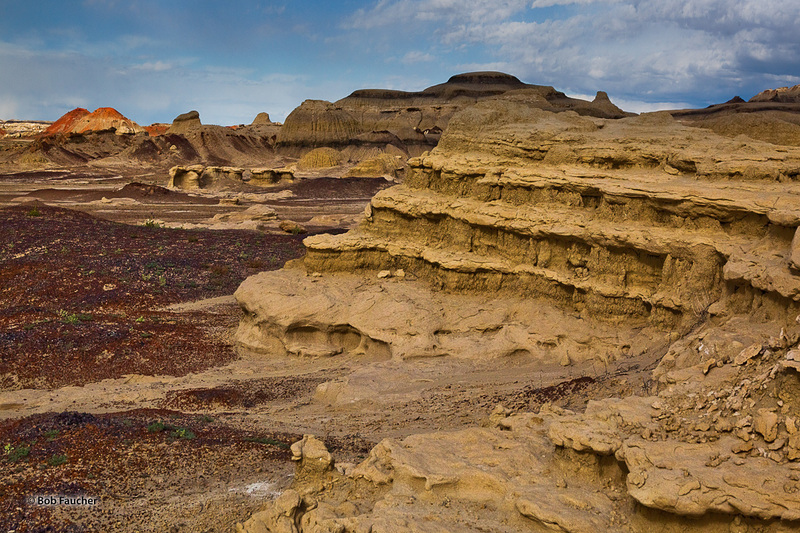 The multilayered erosion pattern in the foreground, hoodoos in the middle ground, and dome shapes of clay in various colors and textures attest to the incredible geologic diversity in Bisti Badlands. The red/purple/black are metamorphosed rock, formed by ancient coal fires. These rocks are found as boulders and strata embedded in the lighter layers, and also as fine pebbles, scattered over the surface. Photo © copyright by Robert Faucher.